Indictment on Border Patrol officer accused of shooting Arab rioter in attack on Ofer Prison; video evidence raises questions. The Jerusalem District Attorney on Sunday morning will submit an indictment to the city's district court against the Border Patrol officer who was arrested on suspicions of killing an Arab rioter during Nakba Day riots in May. The officer has denied the charges, which appear to have been made on the basis of a Palestinian Authority (PA) autopsy that claimed a live bullet killed the rioter, after the IDF stated that only rubber bullets were used to disperse the rioters. 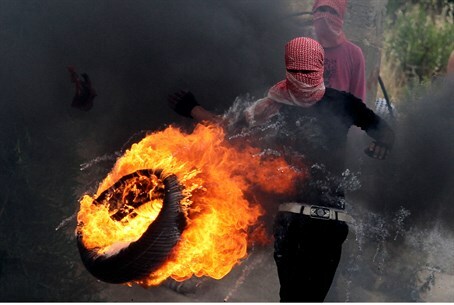 On Nakba Day, the rioter died in Bitunia to Jerusalem's north, while taking part in a violent attack with at least 150 other Arab rioters besieging Ofer Prison and hurling rocks and burning tires, in an apparent bid to break terrorists out of jail aside from the general theme of protesting Israel's very existence. During the violent attack on security forces, two Arab rioters were killed, Nadim Nuwara (17) and Mohammed Abu Taher (22). An autopsy on them was held in Ramallah, after which military police conducted an investigation with the case later passed to Judea and Samaria district police. Apparently the investigation found some evidence causing investigators to believe there was a connection between the supposed bullet and the officer's gun, although details of the findings have yet to be released. Former MK Dr. Michael Ben-Ari has led the push to support the officer, calling on other officers and concerned citizens to donate to save the officer's family from financial collapse - his legal defense costs a whopping 20,000 shekels (over $5,200). Referencing the murder of a 20-year-old IDF soldier in Tel Aviv two weeks ago, Ben-Ari stated "if Almog Shiloni hy''d had preempted the murderer who stabbed him to death he too would be sitting in jail now and be investigated...for killing a terrorist!" There remain large question marks in the case of the dead rioter. CCTV footage of the riot that was released by blogger Elder of Ziyon shows the two Arab assailants who died in the riots falling - but not a drop of blood is left behind, despite the claims that they were shot by bullets that went through their bodies. In both cases the collapsed rioters are removed, and leave behind perfectly clean pavement.